This material is about laying the substrate under the laminate. This stage precedes the installation of laminate flooring and is mandatory, since it depends on it how long a new flooring will last for you. Laying the substrate under the laminate with their own hands - although the work is responsible, but not difficult. From our step-by-step instructions, you will learn how to do this correctly. Before moving on to the substrate, familiarize yourself with the material: Leveling the floor under the laminate depending on the base and the nature of the irregularities. The main functions of the substrate are to smooth out unevenness of the base of the floor, create a barrier that prevents water vapor penetration, prevent heat loss, reduce sound permeability. 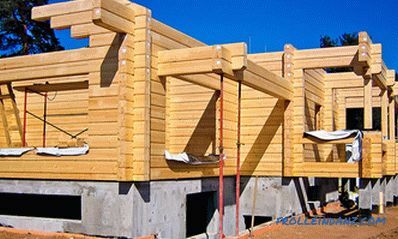 The substrate is supplied both in the form of rolls and in the form of sheets. Within certain limits, its thickness may vary. Laminate manufacturers recommend laying a waterproofing film on the substrate before laying the substrate. But this should be done only when your base has a high humidity. Often a screed filled with many months ago and well dried does not contain moisture and can not harm your laminate. You can verify this in a simple way. On a concrete base you need to put a piece of film measuring at least a meter per meter. All edges of the film must be glued to the base. 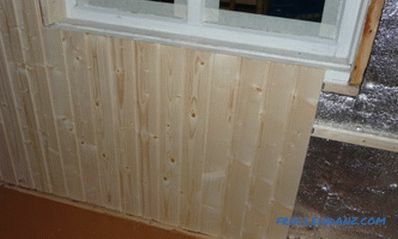 If after a day there are no signs of fogging on the film, then the base is sufficiently dry and the flooring of additional insulation can be avoided. 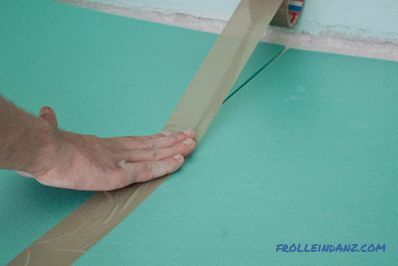 The sheets of the substrate must be connected together with tape. The first step in this process is to prepare the base of the floor. 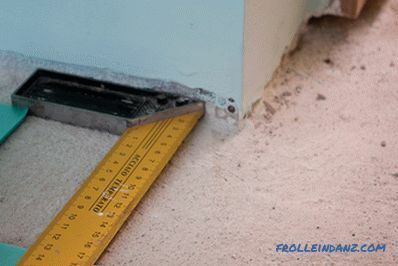 Eliminate all irregularities of the subfloor and make sure that its surface is completely dry and reading. For details, see the material: Preparing the base of the floor for laying the laminate. Preparing the floor surface for laying the substrate. The substrate and the laminate itself must be wound under the door jamb. 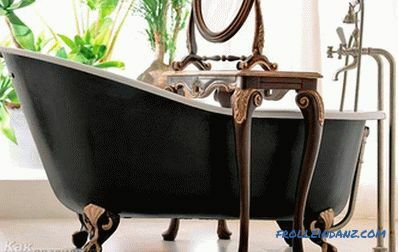 With this approach, you are guaranteed the absence of squeak flooring and a nice looking appearance. Given this, you must remove the remnants of foam from the joint in advance. 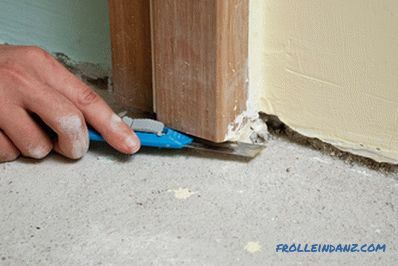 If there is no free space between the door frame and the floor surface, do not cut the laminate to the jamb shape. We recommend that you file the base of the joint with a hacksaw so that the laminate fits perfectly under it. Cleaning the space under the door jamb. Now it's the turn to the substrate under the laminate. 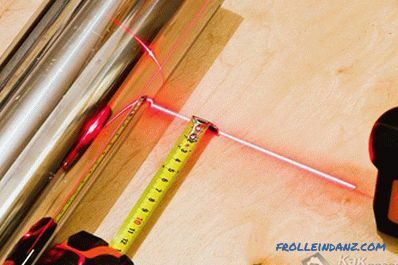 Measure the length and width of the room to determine the exact area of ​​the material you need to buy. Complicated mathematical calculations are not required from you, simply multiply the length by the width. To avoid unnecessary visits to your local store, add to the resulting figure 10% for waste when cutting. 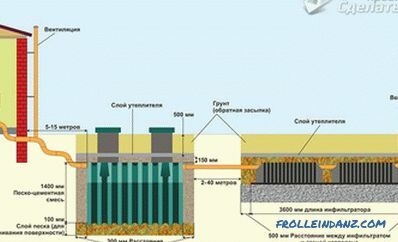 The substrate is sold in rolls and sheets. In our project we used a substrate in the form of polystyrene foam sheets with a size of 50 cm x 100 cm and a thickness of 3 mm, but if you wish, you can use the rolled material - it is just as good. Start laying the substrate under the laminate from the corner of the room and continue until you cover the entire surface. Distance measurement using a joinery square. It is highly likely that you will have to cut the material in order to achieve full compliance with the room geometry. Please note that before taking up the knife, we made measurements and put the corresponding marks on the substrate. To make the cutouts perfect, you need a square (for drawing perfect 90 ° angles) and a cutter. After you cut the substrate in accordance with the required shapes and sizes, put it in its place. Cutting the substrate under the laminate. Now you need to glue the backing sheets together with adhesive tape. In a similar way, you can connect the individual sections into a single coating. We will recommend you to roll the tape up to 50 cm (no more! 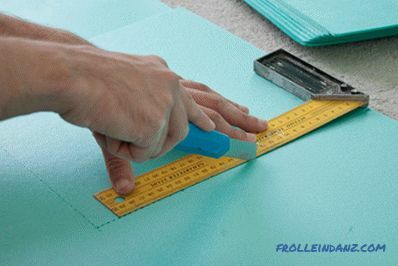 ), And then gently press it onto the joint of two sheets of the backing. We can not allow the joined sheets of the substrate leaned on each other. In this case, you need to carefully monitor that the tape was always well stretched. You can use a special dispenser for adhesive tape, which will greatly facilitate the process of working with adhesive tape. Connect two sheets of backing with scotch tape. Tape all the joints of the backing sheets. 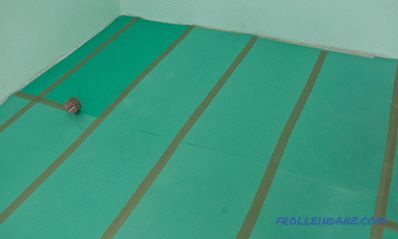 This stage is very important for creating a waterproofing barrier and, accordingly, protecting the laminate. The length of service life of the floor covering depends on the quality of the work performed. Laying the substrate under the laminate is not less important than leveling the base of the floor, so be careful and work with particular diligence. 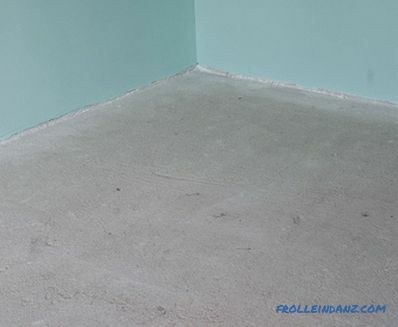 After completing the laying of the substrate, do not forget to thoroughly clean its surface with a vacuum cleaner. See also: Select and install the cork substrate under the laminate.